Last time I wrote an article for Fstoppers was almost a year ago when I had just picked up a Hasselblad V-system medium format film camera for the first time. If you remember my first post, I taught myself to shoot 120 film while traveling in Europe. I reported my findings as best as someone with only a month of practical experience could. In the year that's passed I've learned so much about the modern uses and challenges of this legendary camera system and it has become a fixture in my studio. In today's market it's not always the right tool for the job, but when it is, it's a remarkably satisfying camera to use. A whole year has gone by since I got my 503cw. In October, Hasselblad generously lent me their beautiful CFV-50c digital back. They asked that I implement it into my commercial work and report my findings here on Fstoppers. I took it with me on a handful of awesome shoots from the December cover of Lacrosse Magazine, to a cosmetics ad campaign in my studio to environmental portraits on the Onondaga Native American Reservation. I tried it in almost every scenario I'd normally shoot in so I’ll go through them chronologically. But first, what is this thing anyway? This is the Hasselblad CFV-50c digital back for v-system cameras. The Hasselblad CFV-50c digital back is a 50mp medium format CMOS sensor and digital interface designed to fit where a traditional A12 film back would go on a V-system camera. It essentially replaces your film stock of choice with the same sensor you'd find in the latest H5 series medium format cameras. Below you can see a comparison of various file types used in this review to scale including 50mp from the CFV-50c, 36mp from the Nikon D800, and high res 120 film scans. The first thing I did after unboxing the camera was cruise through the menu and crank the ISO up to 6400. I did what a lot of people do with high ISO, I shot my family in our living room. I feel like this is a pretty common thing to do after unboxing a new camera, find out how high your usable ISO really is. The menu system is so simple compared to my Nikon D800. I love my camera to death but my biggest gripe is the amount of menu functions I'll never use or care to learn that stand between me and the ones I do need. I know the importance of these menu items change for each photographer, but I've seen twice as many people screw up their cameras exploring DSLR menus than ones who really dial their camera in to suit their needs. The menu on the CFV-50c is concise, organized, and essentials only. It took minutes to get acquainted with it. Now, us DSLR shooters hear terrible things about the high ISO performance of medium format sensors. Apparently, previous models from all brands are literally unusable over ISO 800 or so. All of these brands began boasting clean high ISO and long exposure features with their CMOS sensors in only the last year so I was skeptical. Obviously this test is very simple, but indoor shots like these are one of the most popular uses of high ISO on earth. This digital back flatly outperforms my Nikon D800 and the files are completely usable at ISO 6400. My first doubts were put to rest early. This was a clean design that delivers on at least one big promise. So now we bring it to the studio and never consider high ISO ever again. The next day I called up some friends to continue a funny portrait series I started on my D800 with retoucher Jordan Hartley. The test here was as much about this camera system’s functionality in the studio as it was about image quality. I sort of knew the image quality would be beautiful and match the rest of the series fine so really the question was, could I physically use this camera system to do something already challenging with my smaller, autofocus-wielding DSLR? 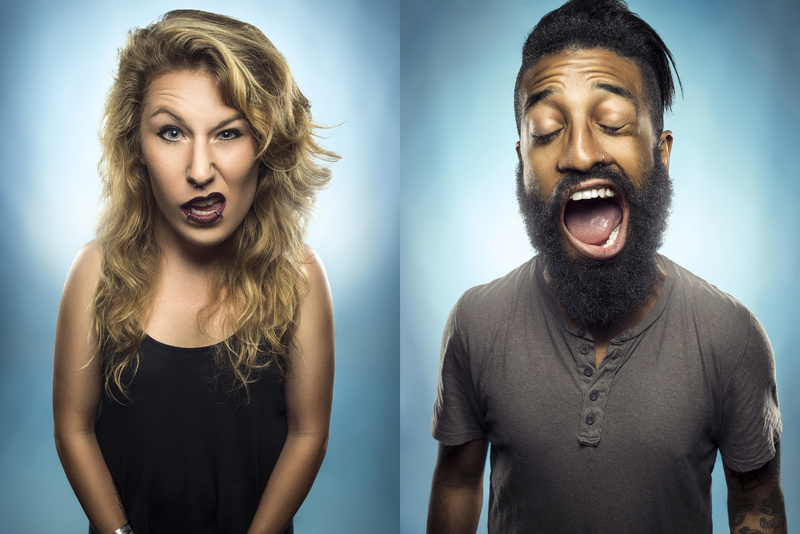 This is Samantha and Aaron who were nice enough to be my first test subjects! 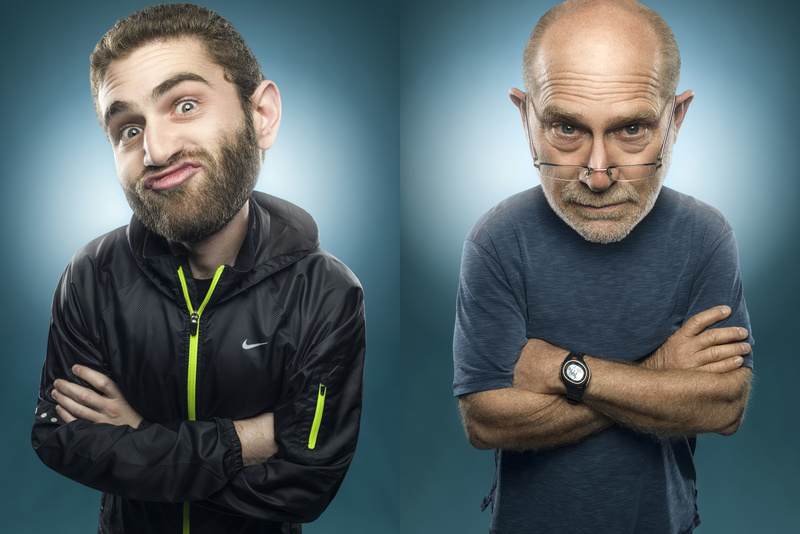 This portrait setup involves four lights and for me to shoot down on my subject from a fully extended tripod in portrait orientation with a wide angle lens to distort their features while they make bizarre faces. Jordan then goes in and exaggerates features in Photoshop. To make sure I give him the best files to work with, I always tether to my PC in the studio to check critical focus and exposure. This is where I started running into the first issues with the CFV-50c and my V-system camera. This camera system is not designed for portrait orientation. V-system cameras were built to shoot 6x6 frames on 120 film. Because the images are square, there is no landscape or portrait orientation. You just shoot. It's one of the things I love most about it. Because of this, waist-level finders and 45-degree viewfinders are just as common (if not more so) than 90-degree viewfinders. The CFV-50c however has the same 6x4.5 CMOS sensor you'll find in the impressive H5 series cameras. This means it effectively crops the top and bottom of your would-be square image and makes you choose which orientation is best for your shot. 90% of what I shoot in the studio is portrait orientation, so using a waist-level or 45 degree viewfinder makes flipping this camera on its side awkward to work with; you're no longer facing your subject and the winder has to be on top or it hits the tripod when using the crank arm. I imagine shooting with this camera system in portrait orientation would be damn near impossible without a tripod. Also, the focusing screen included with the CFV-50c is an Acute Matte D screen, with a horizontal split screen focus that displays the crop factor so you can accurately compose. With the camera on its side, it becomes a vertical split screen focus, eliminating using features with vertical lines (like someone's arms, hair or nose for instance) as a point of reference for focus. This camera system was not designed for portrait orientation, but it works. The CFV-50c's FireWire 800 connection is not PC friendly. 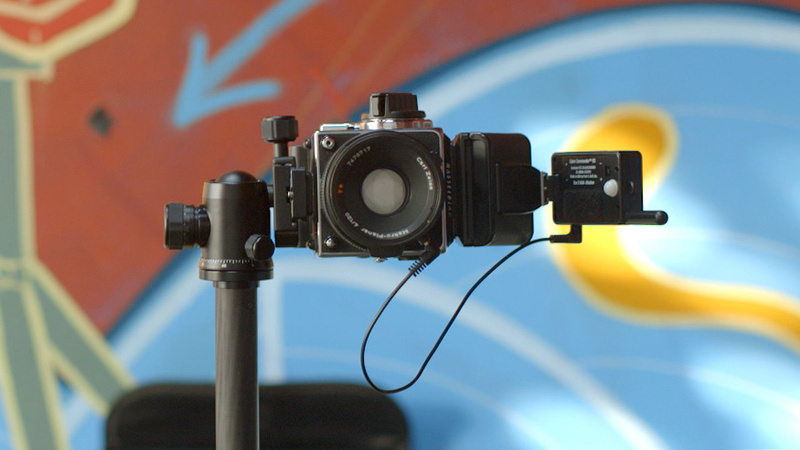 The CFV-50c back uses the same FireWire 800 tether connection you'd expect from other Hasselblad cameras. The problem with this is almost no PC laptops have FireWire 800 natively, and even Macbooks have graduated to the slimmer Thunderbolt connection which requires an adapter. FireWire and USB are not compatible at all, so I found I'd either have to shoot to cards the whole time or borrow a Macbook, something that made the PC builder in me cringe. For this test shoot I shot to a card and found checking critical focus on the Hasselblad's screen was actually quite accurate. That being said, I don't like shooting to cards. I like being tethered, so sort of a bumpy start if my goal was to work this camera system into my everyday tethered workflow. But this was my first go and I got some lovely images. Surely I’d get better with practice. Conclusion: Camera is ergonomically awkward on its side which made focusing difficult, images are still lovely. 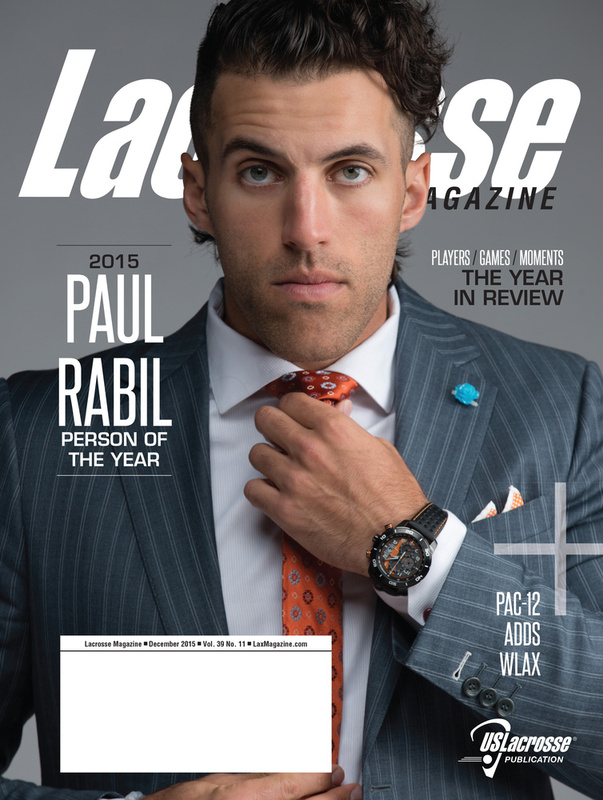 Next on the docket was the December cover of Lacrosse Magazine, which I was shooting with one of my favorite clients and 2015 LM Person of the Year recipient, Paul Rabil. 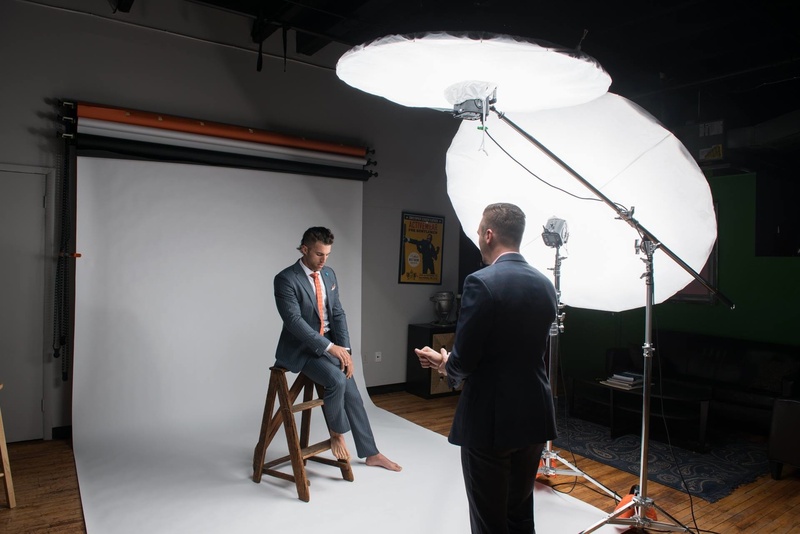 We shot the images for the editorial at Christopher Schafer Clothier in downtown Baltimore, who lent a hand not only styling the subject, but also lent their space and backdrops during business hours. 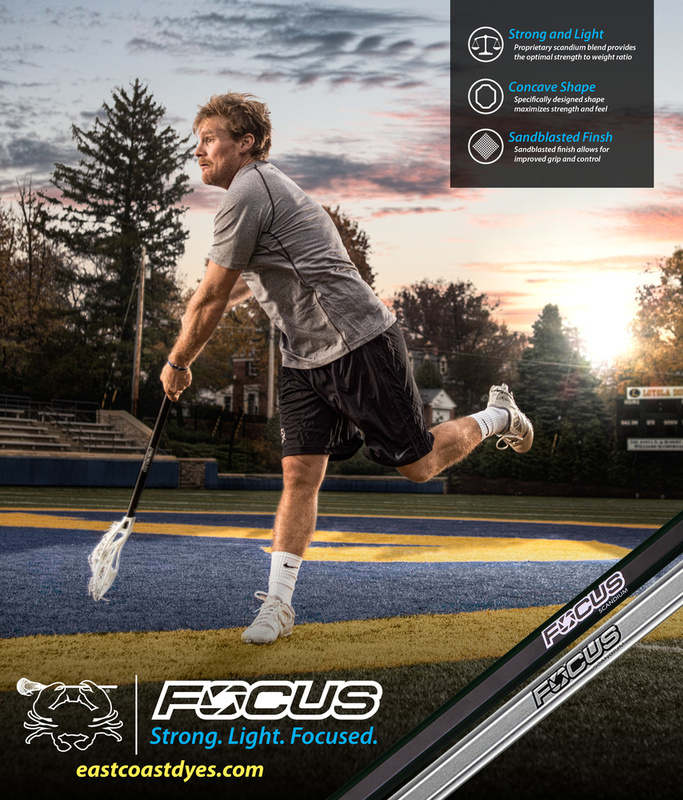 December cover of Lacrosse Magazine. Was this shot on the D800 or CFV-50c? 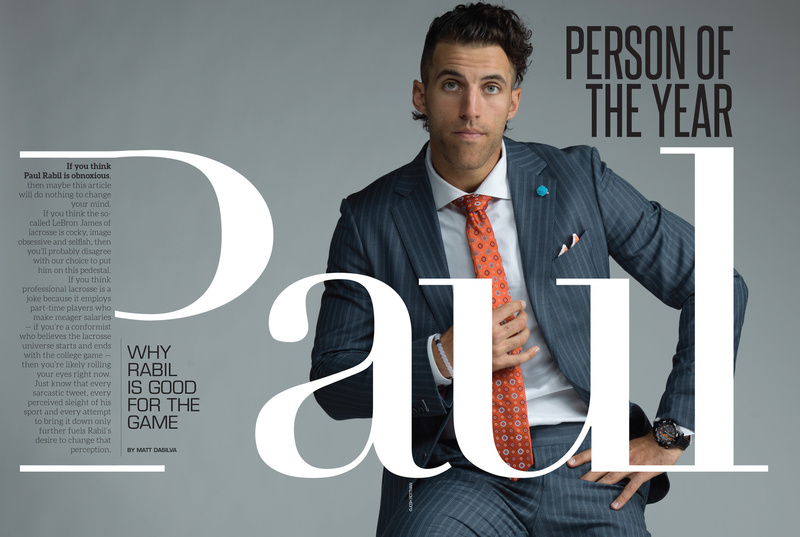 The creative brief was to shoot Paul with soft, directional light on a white backdrop for an uneven mid-gray. Because I had struggled to be efficient in portrait orientation with the digital back in my first test, I decided to set up both of my cameras and shoot everything portrait with my Nikon D800, and everything landscape with the CFV-50c. No specific test in mind here, I had a job to do. 2-page cover spread from the December issue of Lacrosse Magazine. Was this shot on the D800 or CFV-50c? During the shoot, I found that having a camera dedicated to each orientation (something I’d never done before) was actually less cumbersome than it sounds. They were both on tripods at roughly the same height so I just switched back and forth at my leisure and shot to cards on both. The first thing I noticed bringing the photos into post alongside one another was that the CFV-50c reproduced the skin tones and the suit’s colors more accurately than my D800. Paul’s skin tone was richer and warmer, while the grey hue and luminosity values from the background were almost identical across the two cameras. I liked what I was seeing out of the CFV-50c SOOC. In the end, a magazine cover is a portrait orientation affair, so the shot the editor chose came unsurprisingly from the D800 (which I shot six times more photos with because of the orientation, zoom range, autofocus, and lack of winding action). The interior 2-page spread however came from the CFV-50c. Neither of these images have any retouching outside of minor Lightroom adjustments. Conclusion: Color reproduction is remarkably accurate, orientation still a challenge but the CFV-50c has already made it to print. The real test of the CFV-50c, in my opinion, is a big shoot day in the studio. You're shooting client or portfolio work. Other people are in the studio helping you achieve your vision, possibly even the client. After days or weeks of preparation, the pressure’s on and everyone is watching your tether screen to see what you deliver. Your skill and composure are being tested simultaneously. This is when your camera must be an extension of you. This is the scenario I needed to recreate to really test the usefulness of this camera system in my workflow. These are my favorite days. 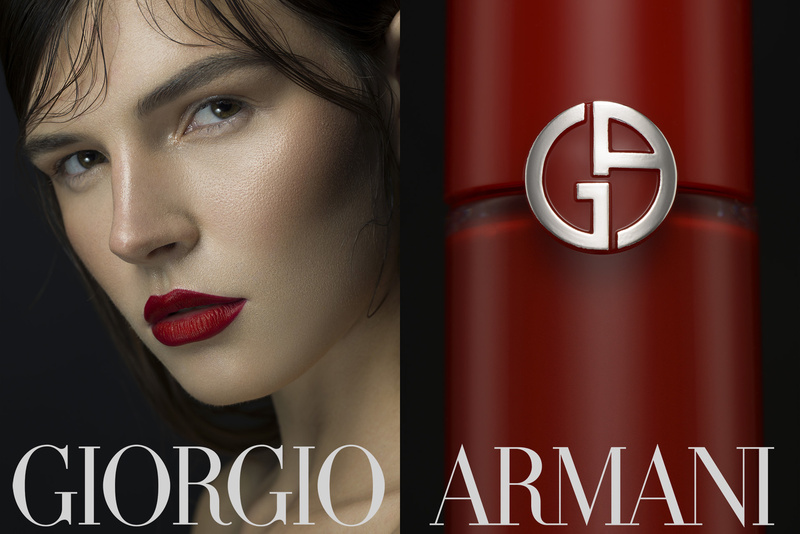 Spec ad for Giorgio Armani Lip Maestro. I shot model Abbey Ford on the CFV-50c but I had to shoot the product on the D800 because I don't have the extension tubes necessary to do this macro shot on the 503cw. 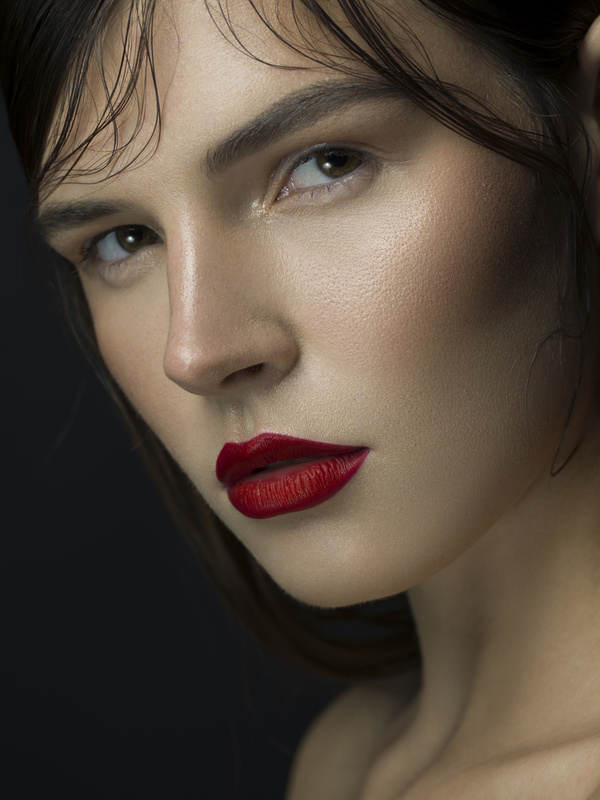 Camera aside, I wanted to produce a 2-page cosmetic ad campaign with one powerful standout addition to an otherwise clean beauty look, perhaps a lip or eye color product. After the portrait orientation trouble I’d been having with this camera system, could I completely cast my D800 aside when it counted? I recruited some local Baltimore talent in model Abbey Ford and MUA Caitlyn Meyer whose work together I’ve admired since I moved here. I gave my thoughts to the two of them and created a Pinterest board for the three of us to collect visuals. The specific product choice I left to Caitlyn since she’d be the one using it. We landed on a lip gloss from Giorgio Armani called Lip Maestro that had a really interesting container I thought would be fun to shoot too. I spent almost a half hour during hair and makeup getting the camera situated comfortably in portrait orientation, and tethered to Phocus. It was easier to get comfortable than my test shoot because I was now shooting slightly up at a seated model, not down from above a standing one. I found nailing critical focus difficult the first time around, so in an effort to make sure I didn't miss on a much shallower 120mm lens, this time I did something I never do; I cranked the modeling lights all the way up. What a world of difference. With the beauty dish so close to Abbey’s face, I was finally able to accurately pull focus from the split screen and she didn’t mind the heat lamp either. My focus accuracy went from roughly 40% during my first test shoot with the 50mm, to over 70% during this shoot with the 120mm macro. Most importantly though, once we got started I got into a groove I’ve never allowed myself with this camera system. I usually only take a few frames of 120 film at the end of each look. The model and I will go through the digital selects from my D800 and find a couple poses that really worked and shoot them again on film. I only have two A12 backs so even if I did want to rapid fire a whole shoot, I could only get 24 frames before I’d have to break to load more film. Often I get the best stuff out of a model well after the first two dozen frames in a look. The CFV-50c allowed me to forget about the constraints of film and just shoot and shoot. While it’s certainly not as fast as a DSLR, the digital back really changes the speed at which you’re able to use your V-system camera in the studio. To tether for this shoot I had to borrow an old Macbook with FireWire 800 from a friend. Despite its lack of serious hardware, it still brought 50mp images into Phocus as fast as I’ve been getting 36mp ones from my D800 into Lightroom lately, and my laptop has more than twice the pertinent hardware. Conclusion: Enabled me to work faster than film, focusing much easier with modeling lights on. Images are massive and razor sharp. I am the manager of video production at US Lacrosse in Baltimore, so I shoot a lot of lacrosse. 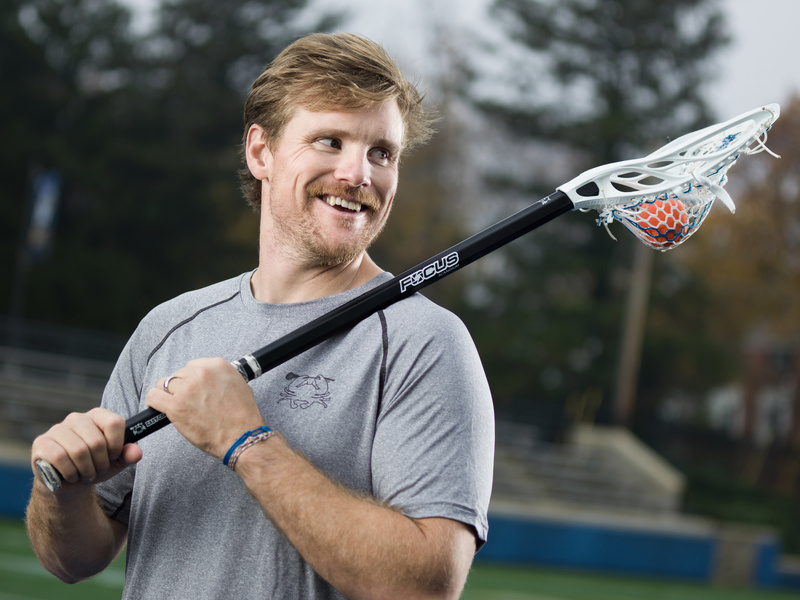 My friends at East Coast Dyes in nearby Towson recently launched a new lacrosse handle, and commissioned me to shoot an ad campaign that would span both print and digital, stills and motion. 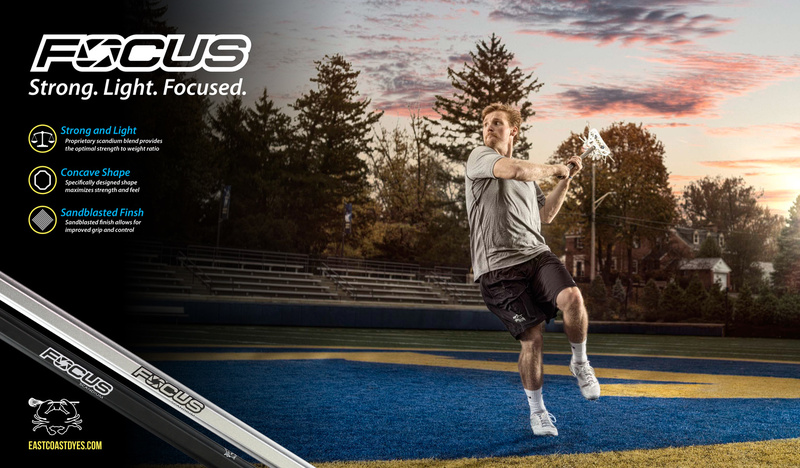 The concept was to shoot 2012 MLL MVP Brendan Mundorf on location, shooting with the sun rising behind him. For the first time I decided to leave my D800 in the car the entire time, but I had a video to shoot for them the same morning too so I needed to work quickly. I like shooting in the studio because locations are usually the first thing to throw a wrench into my shoot’s gears. I planned to use the 1/500th sync speed of the V-system lenses to bring the ambient down a stop more than is possible with my D800, and get beautiful color rising behind our talent, who would be frozen in motion from the strobes. Unfortunately, it was the grayest morning I’d seen in months. There was zero sunrise (so I knew I'd have to composite) and at 1/500th the grey sky was much too dark to be able to replace in post so my shutter speed slowed significantly. 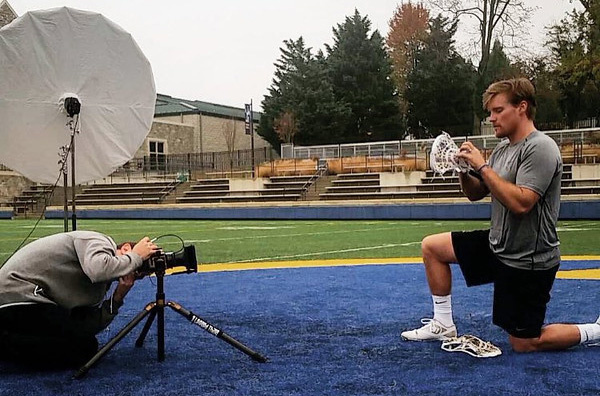 Timing is everything when you’re shooting lacrosse, because a player can go from a dead sprint to shooting at 100mph in a fraction of a second, and sometimes it’s over before you can even push the shutter. Surprisingly I found my V-system camera did a better job of capturing the action the instant I push the shutter. My D800 has the slightest delay that I’ve learned to compensate for, especially when autofocus is on. With Brendan shooting as hard as he could, I was able to capture the exact moments I wanted, even though I could only take one frame at a time. I had him repeat his shooting motion a few dozen times, I never had to refocus, and I easily checked for motion blur on the CFV-50c’s monitor. After I got the shots into post, I really wished I’d practiced Mike Kelley’s sky replacement techniques more. I chose some sunset shots from a time lapse I took a year ago in Berlin, and asked Jordan to composite them in to create the shot I was trying to achieve in camera. Conclusion: Success! An entire commercial ad campaign without touching a DSLR. At the very end of my time with the CFV-50c, my family came to visit me from California. After experiencing everything I had with this digital back, I decided to revisit the same portrait setup I struggled with in my first studio test, and found it came much more naturally the second time. I had learned that cranking up the modeling light would help me nail focus, that shooting to a card and using the CFV-50c’s monitor isn’t the end of the world, and while I’d still like a 90 degree viewfinder for portrait orientation mode, my 45 is totally manageable with some practice. My mom, Gilda. Hasselblad CFV-50c 50mm f/9 1/250th ISO 100. My brother Orin and my dad Keith. Hasselblad CFV-50c 50mm f/9 1/250th ISO 100. I nailed critical focus on twice as many photos per subject on average, and felt I spent more time working on expressions than camera quandaries this time. I left feeling great about what we shot and that my V-system camera really worked for me that day. 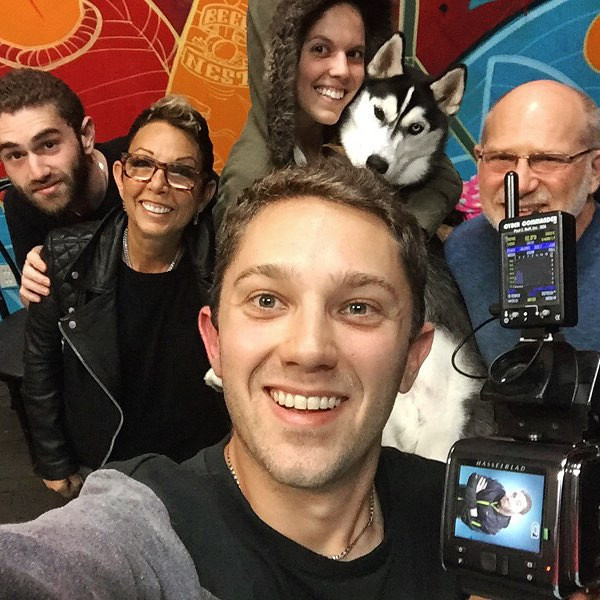 Nothing better than having your family visit the studio. In the last days before I was scheduled to hand the CFV-50c back over to Hasselblad, I was commissioned to shoot video on location in upstate New York for the new Lacrosse Museum and Hall of Fame opening in Baltimore in May. I was working with legendary stick-maker Alf Jacques, and Iroquois faithkeeper Chief Oren Lyons, to create digital exhibitions. After I put the video cameras to rest, I spent roughly 10 minutes with each subject to get one portrait that said as much as I could about their character in one exposure. Because the location of these portraits say so much about the subject, each would require my balancing the ambient and artificial light introduced. I knew I wanted both portraits to be wide open at f/4 so I used my shutter speed to first expose for the amount ambient light I wanted to allow behind the subject and then I adjusted my flash power until it illuminated the subject adequately at that shutter speed. 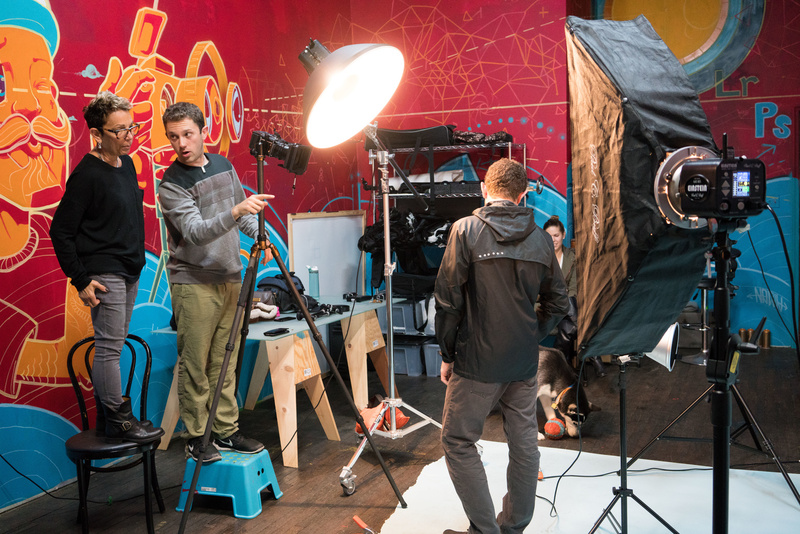 BTS of this 1-light setup. 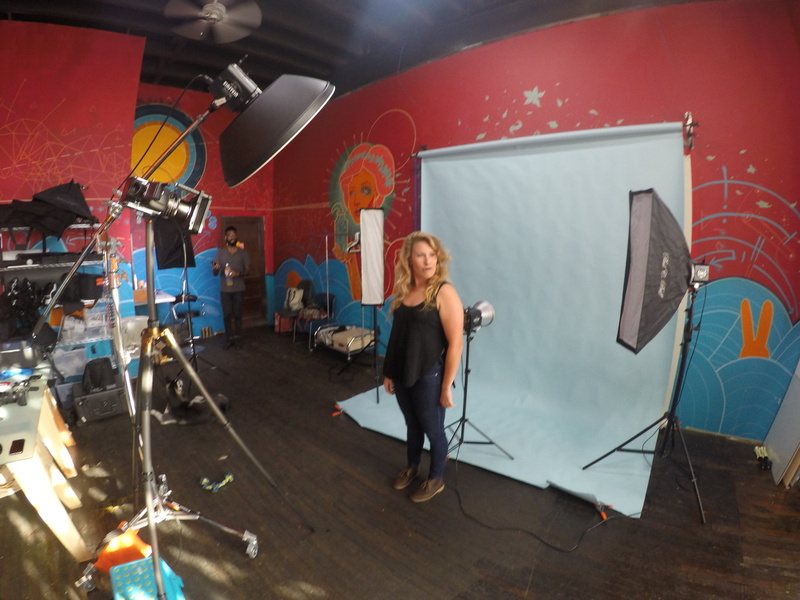 The only modifier is a 7' PLM umbrella with diffusion. I shot Alf in front of his steamer, handmade from an oil drum decades ago. He uses it to make wood pliable enough to bend around the form plate to his right. The sticks are then wired this way for six months before the process continues to ensure structural integrity. 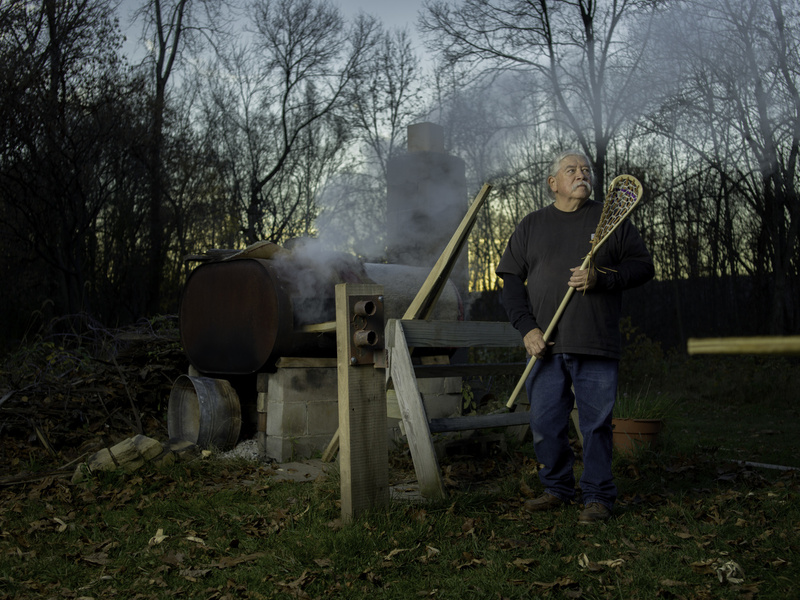 A lacrosse stick from start to finish takes as long as bringing a child into the world, something I doubt is coincidence as they're given to Onondaga children at birth. 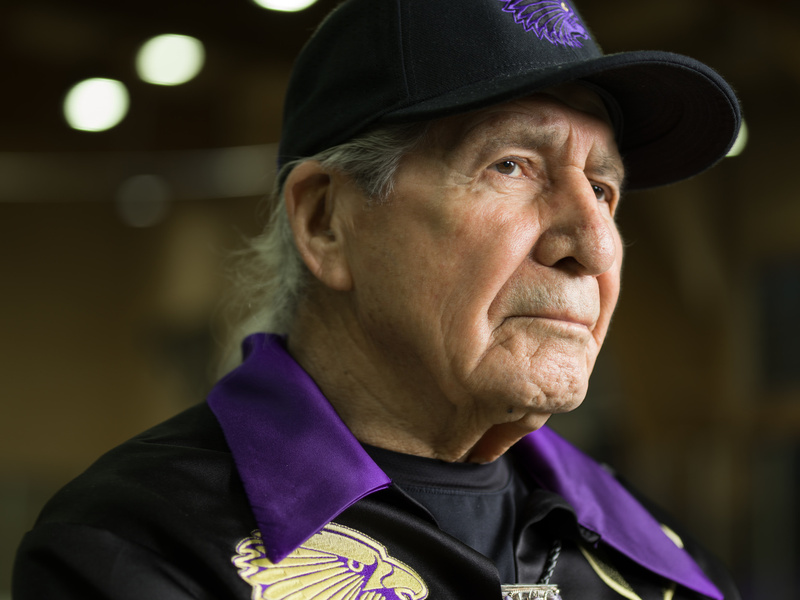 Chief Oren Lyons is extremely proud of the Onondaga Nation's brand new indoor lacrosse facility on the reservation. It is a beautiful arena made predominantly of lightly colored wood, so I wanted to do my best to capture him in the arena. While I took plenty of wide frames with the 50mm lens that show much more of the arena, this tight portrait that I took handheld with the 120mm macro is my favorite, even if the wooden arena blends into bokeh. In an effort to appease the retouchers out there, I’ve asked my friends Holly and Jordan, who retouched the images for this review, to screen capture themselves working on these 50mp 16-bit files. Obviously I want one now. I wouldn’t have spent this much time writing about it if I didn’t. The files are massive and dense, the image quality and tone reproduction are out of this world, and while I think the difference between 36mp and 50mp is actually sort of negligible for many of us, there are so many more superior elements of the CFV-50c's image that make my trusty D800’s pale in comparison. Is the difference worth more than twice the price of a DSLR system that has autofocus, faster shutter speeds, and other shooting modes? The answer to that question will always be different for each of you. Personally, I'm happiest when I'm in my studio, tethered, working with a small team, and controlling every element of my image. I use manual focus lenses with my Nikon half the time anyway, so aside from the issue with portrait orientation ergonomics, which only slowed me down the first few days, I found the CFV-50c a welcome addition to my workflow. If I was going to splurge for one, I'd do it now that they've dropped the price to something more appropriate, something that reflects the lack of certain technologies the H5 series boasts. The biggest piece of feedback I’d give Hasselblad on how to improve the design for future iterations is the sensor needs to spin to accommodate portrait orientation shooters. It would have eliminated most of the headache this camera system gave me. Overall this digital back checks like 9/10 boxes for me and accomplishes just about everything it promises to, namely bringing my 503cw back to rockstar status 20 years after its heyday. I want to thank Hasselblad for trusting my team and I with this nifty little piece of tech. This review was a family affair. Thank you Hasselblad! If you like the photos I shot for this review, please visit my Fstoppers profile and rate them! And thanks for reading. Josh Rottman is an executive producer at Empty Duck Digital and the Manager of Video Production at US Lacrosse in Baltimore. He has a desperate fear of mediocrity and an insatiable thirst for big, bad videos. What lenses are you using with the D800 for comparison? There is certainly a difference in lenses as well as sensors. Before I would accept 'pale in comparison', I would want to see D800/810 files shot with Zeiss Otus lenses which are certainly on par with any offered by Hasselblad. First of all, thanks for taking the time to read the review, that's awesome of you. For Paul Rabil's shoot I was using my 70-200mm f/2.8 and for Abbey my Nikkor 135mm f/2.8 Ai-s lens. Both sharp lenses. And don't get me wrong, I've shot with the D800 for all my professional work and it's sharp as a tack when you do it right so I'm not discounting it by any means. 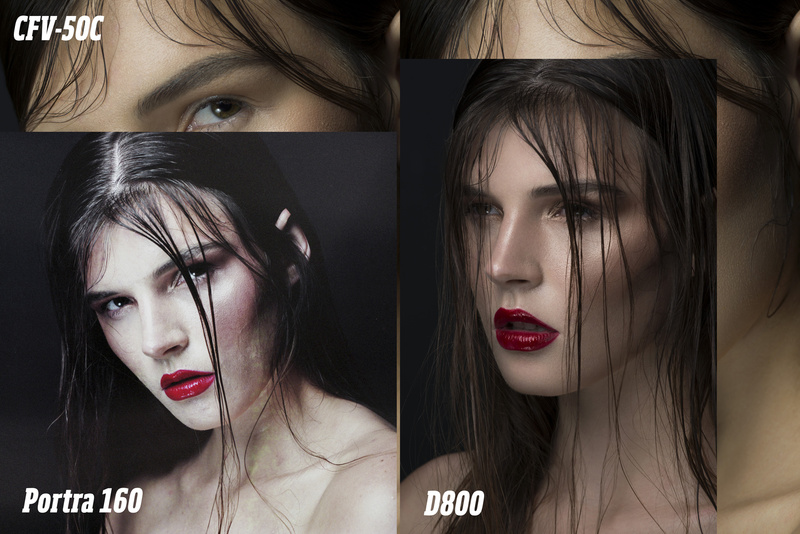 All I'm saying is when you put the image from the D800 on the same Ps canvas with an image from the same shoot on the CFV-50c, there's a clear winner. It shouldn't be surprising to anyone. It wasn't surprising to me. There's a reason it costs more. Also, I don't think anything makes a comparison using Otus lenses on the DSLR a better one than any of mine. That lens retails for 10x what my Hasselblad Zeiss 120mm macro resales for and my DSLR lenses are plenty sharp. I have found that the Otus lenses do make a difference, especially comparing to the 70-200. I own both the 55 and 85mm Otus lenses and over the past year they have been the lenses that i reach for first. I used to live with only my 70-200 and now I find that it stay in the case on most studio shoots (50% when on location). When I first got the Otus lenses, my impression is that they reminded me very much of my Hasselblad/Zeiss lenses. The Nikkor lenses that compare in terms of sharpness are my 85mm PCE and 105mm DFC. I am not wholly discounting your conclusion. I happen to own both a Hasselblad H system and Hasselblad V system (including the CF 120mm). I have been curious about the CFV. It might be worth renting to compare. It was something that I had considered when looking to improve my output. I considered a new back for my H1 as well as the CFV. The route I chose was to get the Otus lenses and to date they have performed quite well. Dan, the comparison with a D800 + Otus would not be fair: remember that the CFV-50c module works on the old Hasselblad V systems, therefore with the old Zeiss glass. Although it's ultimately moot, I would have compared transparency film to the neg stock you used. You'd get much better image quality that from neg stock. I'm curious about this lag you're feeling on your D800, I feel no lag whatsoever on my "lowly" D600. I'm open to all suggestions to get better digital images out of my film. Please feel free to elaborate! As for my D800, like I said in the video, I beat it up. It's been to a dozen other countries, been checked in a Pelican dozens of times, been dropped, serviced, and brought back to life (and some of my lenses have to). I've worn off rubber grips and cracked the pop up flash off. I do shoots like this with athletes doing a repetitive motion often and since I'm usually using strobes I have to time it as best I can. With my D800 I have to push the shutter a hair early and I have had to as long as I can remember with every lens I own, manual and auto-focus. It's something I'm used to and definitely doesn't represent all D800 cameras. Positive stock will give you much cleaner scan that neg stock, which generates incredible noise for some reason. Positive stock needs more attention to exposure, but that was a controlled lighting shot of your model, you could have gotten a much similar look from chrome and, dependent on how it's scanned, similar resolution, assuming 50 or 100 ISO (although I think 50 ISO 120 is now history). That said, you should have been able to extract more dynamic range from your neg scan than your print exhibits, unless you scanned a print for this example, in which case you're shooting yourself in the foot. ;-) How did you scan your neg? I thought it was very informational and lengthy article thanks for that, but I'd have to agree with Dan Howell here too. Still gives me a great idea of the differences though. Fair enough. I'm going to add a link to two JPEGs at the bottom of the article so people can download the files and examine the differences for themselves. How does that sound? Hey! great great work! this has nothing to do with your images,but from the retouching videos! those music mixes are great!!! please do you have link where i can download them from please? i'd really appreciate it if you help out somehow! I'm going to read the article in it's entirety tonight, but the first thing I noticed is your mom has the same All Saints jacket as me! ah! I posted on your photo on instagram asking your thoughts and you said you were putting out an article on Fstoppers soon... and now here it is! That's awesome thanks for following! I still have to share these images on my social, I've been stockpiling so I'd have something to link to. Resolution and color accuracy is cool, but 40-70% focus accuracy in studio would drive me insane. It drives you way more insane when it happens on film. At least with digital you know when you missed and can keep shooting. Nothing worse than finding out a few days, weeks, or months later. Wow no joke about how in-depth this article is, which is awesome! Also love the studio wall! 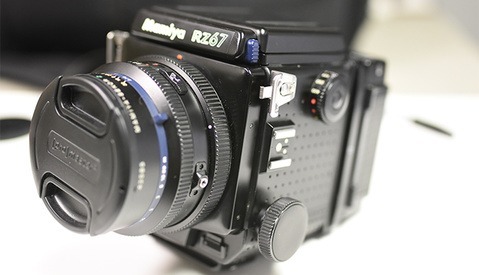 As for medium format, you're right its not just about the megapixels but the colors. Looking back at some of the images that we shot on medium format at the Fstoppers workshop the amount of detail is crazy and the colors are beautiful. Loved the article, and the details. If only money grew on trees to get all the toys in the world. Also whats the song used in your BTS is now stuck as an Earworm, do you have a title or artist name? Nice article but I would not use a companies logo to suggest you shoot an advertising campaign and I think stoppers should not promote such a thing! You're probably right, I could avoid using logos and branding that aren't mine. In this case, I didn't. But I absolutely never suggest I shoot commissioned work for someone I don't. It's labeled as Spec work, I discuss how my team and I decided on that product specifically, and at the end of the day cosmetics and beauty is what I like shooting and a lot of commercial work in that space revolves around promoting the product and the brand. I'm of the opinion that if there's real confusion about whether I was commissioned, I probably did a good job shooting it but if GA disagrees, I'd do nothing but respect their wishes. I tagged them to make sure they're aware. Truly enjoyed reading this article and as a DSLR user who went Medium Format last year it brought back some of my own struggles when i first switched formats. Like you i was double shooting with both my Canon and my Hasselblad for the first few jobs until i realised i was using the Hasselblad files to deliver my work anyway. It is correct to say there is so much more to pixel count or colour rendition that makes shooting medium format enjoyable. If you ask me both my Canon filed and my Hasselblad files are tack sharp, both have very good dynamic range (even tho i think I'm partial to the Hasselblad files on this one) but the Hasselblad just has that quality in the raw files that makes it just much more easy, delicious, enjoyable? to do post on... maybe it is all in my head but one thing I am certain of is that when i feel I'm "in the zone" it will show in my work. In regards to the "portrait" issue I wonder how would you feel with a H5D in your hands? I'm hoping Hasselblad might let me find out how I like the H5D next. Is that a review you'd read? Thanks for this article. Very interesting. I'd like to see a comparison between the old CCD Hasselblad back and this one, as well as the newer BSI sensor in the a7R M2 to both. The sensor in this back is the Sony Exmor; would be interesting to see the comparison to the 42 one in the a7R M2 as the BSI one in the 42 MP one should have higher quality than the older Exmor in the D800. I'd gladly shoot a comparison if you'll help me wrangle all those cameras! It was a lot of work just to get my hands on this one for as long as I did. I ditched the same CFV/Hasselblad V system combo in favour of a fully digital system a while back, and haven't looked back since. Most of the time I don't mind having to wind on the shutter every shot, but when speed is of the essence it becomes a chore and shots are missed when shooting people. I could of course got an electronic winder! Also the 45 degree viewfinder is a pain in portrait orientation, as it's unintuitive based on the angle your head is at versus the subject's position. I'm sure you know what I mean! It's also worth noting to any potential buyers out there that the lack of communication between the CFV digital back and manual camera body/lenses means none of the useful EXIF data is stored in your RAW files; so simple things like focal length, ISO, aperture etc. are missing, and crucially lens information. This becomes relevant especially when post processing and applying lens corrections. If shooting tethered you can select the lens in Phocus software, and also enter the distance to subject etc. to apply the correct lens correction algorithms - but of course you need to then get the tape measure out. 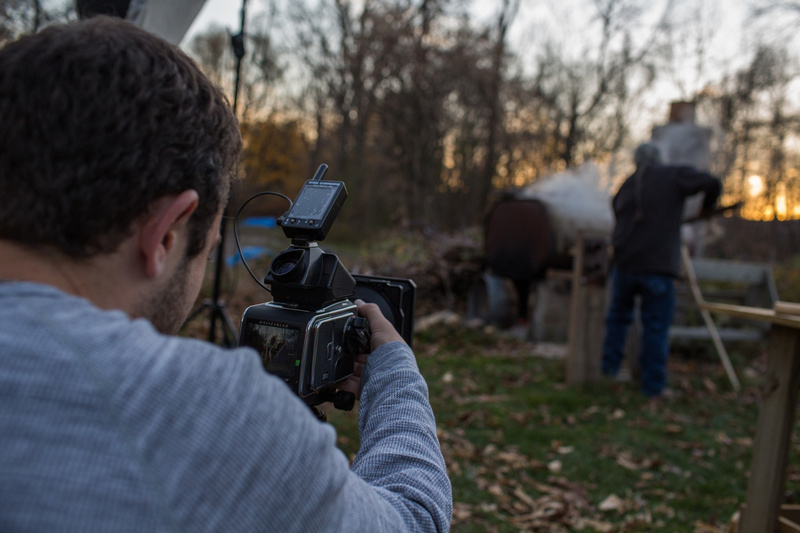 If shooting untethered - especially in the field - and switching lenses and distances to subject all the time, this becomes impractical without an assistant or a lot of time on your hands. Great image quality of course, but this camera system definitely suits certain applications like studio still life more than commercial portraiture. This "lack of EXIF data" worries me. Are you saying that even on a "electronic body" like 203FE and using CFE lenses, there is absolutely zero EXIF information? I can't speak to the 200-series cameras because I didn't use it myself, but I can say that the CFV-50c did NOT record the shutter speed or aperture settings of my 503cw. Only the ISO and WB. Obviously I didn't expect it to though because it's not an electronic body. Strange, I wonder if there is a way to "dial-in" the SS and Aperture settings on the back? Maybe it's just not capable of recording any of that info.